Talofa O-A-Mai-Oe! This past week was pretty good and we got to do a ton this week! I gave myself a haircut for interviews with president, but that isn’t too important. It really started off with first being able to talk with this black salesman who was from Atlanta, Georgia. His name was Quame Dubos and he was really cool and fun to talk to. At the time I had seriously been getting restless in my area because I have been in the area for nearly 8 months, and I think that this was a tender mercy of the Lord because I love talking to black people or just people of any color – I love them all! Anyways he was cool, and though he made us late to one of our appointments, it was still worth it because he was asking all of these really great questions pertaining to the church. He even told us during the conversation that he was really interested in studying religion, and that he had talked with a bishop a couple of nights ago about the church, and that the bishop gave him a Book of Mormon that he could have and read for himself. We talked for a little more than an hour and so that was definitely fun. He was really interested in the things that we had to say, and he was happy to know that we were just average normal people (Elder Moyers & I) because he asked us if we have ever cussed in our lives and we both told him that we had. I know that isn’t a great thing, but still people want to know the type of people that we truly are, and by doing that we sometimes have to admit to certain things that make us regular/normal people. The way he ended the conversation was cool too because he said “See y’all in the celestial kingdom!”. Did I mention that I love black people? Yup Yup! 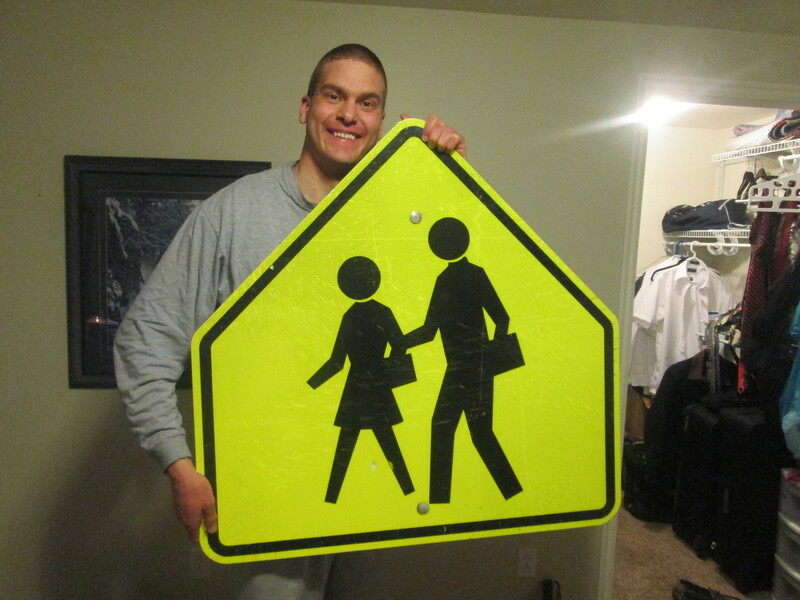 The next colorful moment that we had was that we found and brought home a crosswalk sign that was in a field right behind one of our church buildings! Random, right? We thought that it was pretty cool; it barely fit into the back of our trunk when we went to take it home with us. We got pictures though and we definitely find amusement in looking at it too.The back pole was torn off of it and it has tire tracks from what looks like a truck so we figured that nobody wanted it anymore haha. The last colorful moment was that conference was awesome! We had two of our investigators either go to conference or watch it and, both of them enjoyed it a ton too! I know that both Elder Moyers and I did so it went well! The Sunday afternoon session that I went to was awesome and there was definitely a lot of good that was said in the meeting too! I thought that it was cool that for my final general conference I was able to close it up by going to the Sunday afternoon session – to get to be a part of the final closing events when you know that by the next time they have conference you will be home (I am not trunky… yet). This week will most likely be a better week when it comes to the progress of investigators, but we will have to see how everything plays out. I am sorry that I have been getting lazy when it comes to things like writing letters, but I will try and be better about that. I don’t really have anything else that I can think of, but I do hope that all of y’all continue to do well and take care of yourselves.